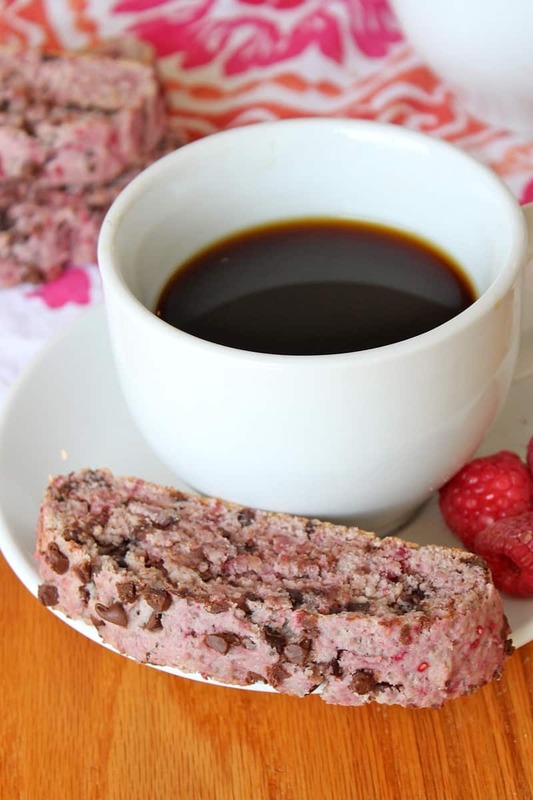 Organic frozen raspberries bring such a beautiful color and sweetness to these light and crispy chocolate chip biscotti. 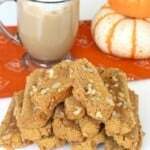 Okay, let’s take a quick break from pumpkin bread, apple pies, and caramel cookies and cleanse our pallets with some biscotti! Did I just say biscotti? That’s right! 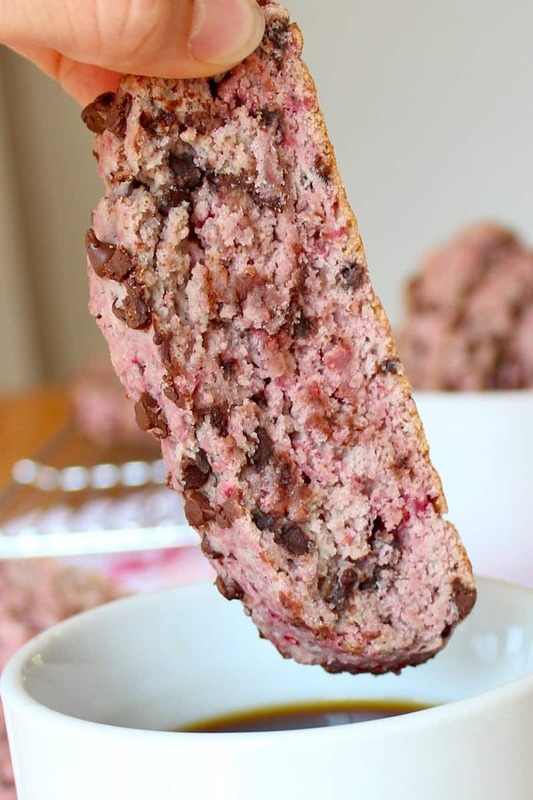 Raspberry Chocolate Chip Biscotti to be exact! And it’s pretty darn tasty! 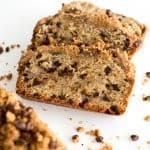 Honestly, I’ve always assumed biscotti to be quite boring so I usually choose a big cookie or a slice of cake to go with my coffee, but that all changed on a recent family vacation to Washington state! 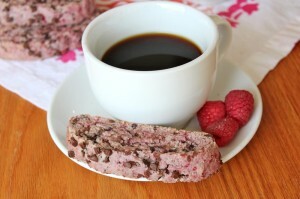 I had some of the best chocolate chip biscotti with my latte one afternoon and I quickly became a fan! It was light and crisp with a slight chew and lots of chocolate flavor. I was surprisingly impressed and couldn’t wait to get home to bake some biscotti of my own. So I did just that and it turned out great! It was way easier than I had imagined and the possibilities are endless when it comes to flavors. Preheat oven to 350°F. Line a large baking sheet with parchment paper and set aside. 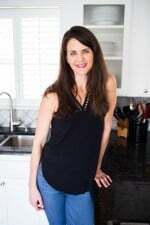 In the bowl of an electric mixer, beat the butter and sugar until well combined. Add the eggs and vanilla and beat until smooth. On low speed, beat in the flour, baking powder and salt. 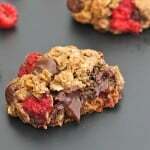 Stir in the frozen raspberries and ½ cup mini chocolate chips. Dough will be thick, cold and sticky. Using greased hands, divide dough in half and shape each half into a rectangular loaf on the prepared baking sheet. 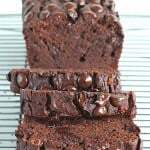 Sprinkle loaves with remaining ¼ cup mini chocolate chips. Bake for 25-30 minutes or until a toothpick inserted in the center comes out clean. Cool on cookie sheet 15 minutes. Cut crosswise into ½-inch slices and lay back on baking sheet. Bake 15 or until starting to brown and dry on top. 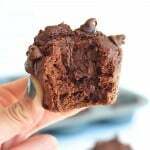 Turn each slice and bake another 10 minutes longer. Remove biscotti to a wire rack to cool completely.